You Are Here: Home » Blog Accessibility Testing Tools » What’s My Favourite in My Accessibility Toolbox? Working as a Web Accessibility Consultant over the years, I have accumulated quite the toolbox for assessing accessibility of websites and, now, of blogs. One of my favourite tools remains the Colour Contrast Analyzer, available for both the PC and the Mac. The result is immediate and easy to understand; no need for memorizing the contrast ratios required by the Web Content Accessibility Guidelines 2.0, which takes some deciphering. 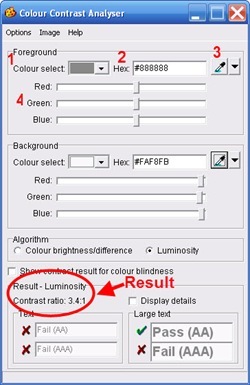 Because the Colour Contrast Analyzer is a standalone application, it can be used for testing colour contrasts anywhere in any program – when creating ebooks, graphics, newsletters – anywhere where colour combinations may affect onscreen readability. I love that! And, did I mention its free?! Try it on your blog and share what you discover in the comments below. One Response to What’s My Favourite in My Accessibility Toolbox?